Staying in Malaysia means you have to be able to tolerate extreme heat and scorching sun. The sunrays are very bad for the skin. Especially for a person like myself that zips around town on normal afternoon under the blazing sun, I have to really take good care of my skin. We all know that too much sun can cause sunburn, wrinkles, freckles, rash problems...etc. Lately i discovered little spots on my face, seems like i'm growing freckles. oh horror of all horros. Therefore i've been more dilligent to put on sunscreen before i go out in the morning. Unlike my usual regime of "dont care just splash on thick foundation will do" attitude. Foundation doesnt help your skin, they only makes it worst. Nowadays foundation comes with some amount of SPFs, like the Revlon colorstay that i'm using, It is SPF 6, which is good, but not enough. I still feel that a good sunscreen is vital to survive our climate. Make-up is bad for our skin because it eats'em up. Therefore on weekends, i like to leave my face clean and if possible without make-up. However when I have to go out, i cant' go out barefaced as erm.....well, don't want the hubby to say i look like a "si lai"/auntie right??! Tinted sunscreen is godsent! It works well like moisturizer, provide a good amount of SPF's and, its beige tint evens out your skintone so you can skip the foundation. I see it as a lite-version of foundation that allows your skin to breath. "Whitening Tinted Sunscreen Moisturiser SPF 35"
The eversoft one is by far the best. It is non-greasy, water-based. Can use it as make-up base before your foundation on regular make-up heavy days too. Please don't be disturbed by the word "whitening". Whitening products doesnt make you fairer. 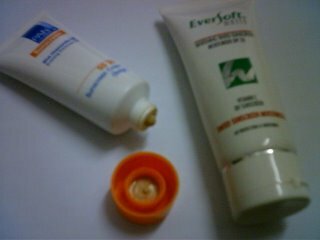 The purpose for whitening products is actually to lighten dark spots and even-out the skintone. I dont' know why asian girls like to be fair. I like even skin-tone more than anything. However, i gave this a try. And, i was pretty amazed with the quality. 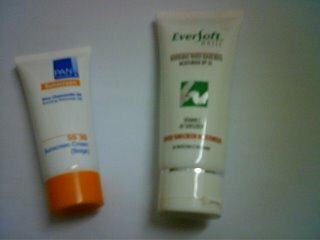 For the sunscreen they have 2 colors to choose from. White and Beige. The Beige is color tinted. What i like about the texture of this one is that after application, you can feel a powdery finish on your skin. And your skin immediately feels soft and subtle to touch. I've been using this one quite often lately. I've taken to like it very much. I believe the SS30 means SPF30. 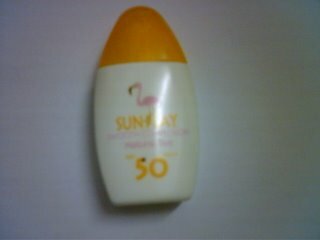 Lastly, I bought this one from Sunplay last year together with the sunscreen lotion before my trip to the beach. I used Sunplay SPF130 when I went diving but I heard some people say it isn't very good so I've stopped using it. I'm now on the hunt for a good sunblock for the body. I usually use the Loreal SPF50 sunblock for my face but it's a bit steep. Think I should give your recommendation a try! Btw, what's the difference between tinted and non-tinted? Im currently also using Loreal SPH50. But the problem is my freckles still will appear after I apply it with my SPH30 foundation, is still the same. I thinking is there any solution to cure and prevent freckles, Ms Fashionasia. stargazer: tinted means got color. Non-tinted means no color. Tinted can be used like a foundation but mild color only. :) comprende?? where did u buy the moisturizer? ?